Reshaped combustion chamber and new cam profiles increases the compression ratio to 12.8:1 To help maintain intake efficiency and power output at high rpm the downdraft intake manifolds are now 10mm shorter All-New 999cc GSX-R1000 is a clean sheet design built to maximize combustion efficiency with more torque and power across the rpm range and enhanced throttle response and reduced exhaust emissions. The new engine is shorter front to rear allowing engineers to use a shorter wheelbase AND a longer swingarm for improved racetrack performance New more oversquare bore and stroke of 74.5mm x 57.3mm (from 73.4mm x 59.0mm) gives the engine better overall tuning potential, specifically increased performance at high rpm Suzuki engineers were also able to increase low-range and mid-range performance and broaden the torque curve by reshaping the combustion chamber, increasing the compression ratio to 12.8:1 (from 12.5:1) and developing new cam profiles. To help maintain intake efficiency and power output at high rpm the downdraft intake manifolds are now 10mm shorter (138mm from 148mm). SRAD airbox is also new and lighter. The revised combustion chamber shape also accommodates new larger intake and exhaust valves. Intake valve size is increase from 30mm to 31mm and exhaust valve size is increased from 24mm to 25mm. The steel alloy used to produce the single valve spring for each valve has been revised along with camshaft profiles. The new intake camshaft is shorter and lighter and the cam angle sensor has been relocated from the left end of the intake cam to the center of the exhaust cam, allowing the cylinder head to be reshaped for reduced weight The close ratio six speed transmission’s input and output shafts are now triangulated with the crankshaft. The crankshaft is positioned more forward in the cases relative to the cylinder centerline, the transmission input shaft has been moved upwards and the transmission output shaft has been moved forward As a result the distance between the crankshaft and the transmission output shaft has been reduced by 59.6mm making the engine shorter front to rear. Repositioning the transmission shafts also allowed the crankcase assembly to be simplified , now using two bolted-together (upper and lower) sections instead of three, eliminating 16 screws and helping to further reduce weight by about 670 grams. The single counter balancer shaft is now smaller measuring 20mm in bearing diameter instead of 23mm for reduced mechanical losses The back torque limiting clutch incorporates the Suzuki Clutch Assist System (SCAS) for light clutch pull and optimum clutch performance. The clutch is now directly operated by a cable instead of a hydraulic system, improving feel and feedback to the rider as well as reducing weight A new integrated clutch and starter motor cover is about 200 grams lighter than the two individual covers previously used. A new more efficient oil cooler also has a trapezoidal shape instead of the more conventional rectangular shape, allowing the lower fairing to be narrower for improved aerodynamics. The radiator and new oil cooler also allow for the use of narrower bodywork for reduced drag. A powerful microprocessor in the ECM runs the advanced engine management system, starting with the latest versions of the latest versions of the SDTV downdraft double-barrel fuel injection system first introduced on the GSX-R1000. The SDTV system uses two butterfly valves in each throttle body barrel, the primary valve controlled by the rider via the twist grip and the secondary valve controlled by the ECM. Each throttle body feeds two cylinders and each throttle body barrel carries two ultra-fine-atomization, 12 hole injectors. Each cylinders primary injector is aimed at a steep 30 degree angle down the intake port to improve fuel atomization and operates under all conditions. The engine managements Idle Speed Control (ISC) improves cold starting, reduces cold start emissions and stabilizes engine idle under various conditions by automatically regulating the volume of fresh air fed into the throttle body circuits, based on coolant temperature. Spark plugs with finer, Iridium-alloy electrodes produce a stronger spark for better combustion The latest version of the Suzuki Advanced Exhaust System (SAES) incorporates staggered length titanium head pipes, a collector, a short mid pipe and a stainless steel under engine chamber that leads to two Moto GP inspired titanium mufflers. A Suzuki Exhaust Tuning (SET) servo controlled butterfly valve built into the mid pipe helps maximize torque throughout the RPM range. The under engine chamber carries a catalyzer to help reduce hydrocarbon, carbon monoxide and nitrogen oxide emissions. The computer controlled Suzuki PAIR system injects fresh air from the airbox into the exhaust ports further reducing emissions by igniting unburned hydrocarbons. Ventilation holes positioned underneath the bottom of the piston stroke in each cylinder bore allow air trapped underneath each descending piston to quickly escape to adjacent cylinders. Unique Suzuki Drive Mode Selector (S-DMS) system allow the rider to select one of three fuel injection and ignition system maps, adjusting power delivery to suit personal preference. Using a button now located on the left handlebar control module, the rider can instantaneously switch between the three available maps, which are designated A, B and C as displayed on the instrument panel. All new more compact twin spar frame welded together using five cast aluminum alloy sections including a steering head section, two main -spar/swingarm pivot plate sections and cross braces above and below the swingarm. The new aluminum alloy swingarm is constructed using just three castings and is arched to make room for the dual titanium mufflers to be tucked in tightly on each side. 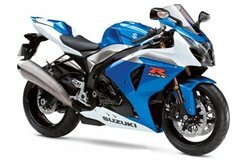 The new more compact 09 GSX-R1000 engine allowed the design team to shorten up the mainframe reducing the distance between the steering head and the swingarm pivot while also reshaping the main spars to precisely fit the contours of the new engine. New dimensions allow the use of a swingarm that is now 33mm longer, measuring 577mm from the center of the pivot shaft to the center of the rear axle in the standard position while still reducing the wheelbase by 10mm to 1405mm. A new one piece die cast aluminum alloy rear subframe and tailsection support is now lighter and seat height is unchanged at 810mm New Showa BPF (Big Piston Front) 43mm fork design eliminates the internal cartridge assembly inserted into each fork leg and instead uses a single 39.6mm upper piston riding against the inside wall of the inner fork tube. The larger piston and shims used in the BPF forks produce more effective valving, with more controlled compression delivering better feedback to the rider. The BPF design relocates the fork springs to the bottom of each fork leg, where they are completely submerged in oil, reducing fork oil foaming and contributing to more stable damping. The rebound and compression valving adjustment screws are indented into the fork caps. Spring preload is adjusted at the bottom of the fork leg assembly. Each BPF fork leg is also 720 grams lighter than the conventional fork tube it replaces. The Showa rear shock works through an aluminum alloy linkage mounted on the swingarm, with an extruded aluminum alloy link rods connected to the frame. The rear shock absorber is adjustable for rebound, high and low speed compression and spring preload. Electronically controlled steering damper uses the ECM to monitor motorcycle speed and adjust damping force as needed. The new GSX-R1000 front brake system matches fully floating 310mm drilled discs with radial mount race proven mono-block forged aluminum alloy front brake calipers New front brake calipers are more rigid despite each being 205 grams lighter than conventional bolt together calipers, reducing flex and improving feedback. The radial pump front brake master cylinder now measures 17mm (from19mm) for improved rider feedback and feel. Newly designed cast aluminum alloy wheels feature a more aggressive design and are also lighter. The rear disc brake works with a single piston caliper mounted above the swingarm. The new wind tunnel tested upper fairing is wider, providing better wind protection while also reducing turbulence and drag. Re-designed SRAD intakes are larger and positioned closer to the centerline of the fairing nose, where air pressure is the highest. The multi-reflector headlight incorporates a new look with vertically stacked high and low beam halogen bulbs centered between position lights on each side. The sharply creased fairing sides feature a layered look that improves the flow of cooling air through the radiator and away from the rider. The rear turn signals feature clear lenses over amber bulbs and the lenses are integrated into and wrap around the outside edges of the seat cowl. The LED combination taillight and brake light is built into the rear of the tailsection, featuring a red, mirror lens, covering LED's. Footpegs remain three way adjustable in 14mm in a horizontal and vertical range. The new sculpted fuel tank is lighter while retaining 17.5 liters of capacity. The all new instrument cluster is centered around an analog tachometer framed by an elegant silver ring with an adjacent digital LCD speedometer. A new programmable engine RPM indicator system incorporates four LED?s. A new speedometer display mode switch is now mounted on the right handlebar control module and can be used to trigger the lap time counter.